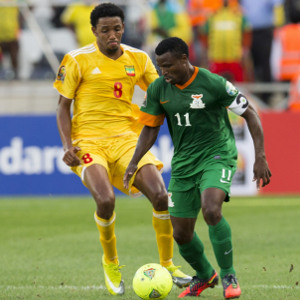 Ethiopia earned a valuable point at the 2013 Africa Cup of nations when they came back from behind to hold Zambia to a 1-1 draw at the Mbombela Stadium on Monday afternoon. Collins Mbesuma broke the deadlock just before the break but Ethiopia responded in the second half through a well-taken goal from captain Adane Girma. The defending champions showed their intentions as early as the third minute when Stopilla Sunzu was given room to push forward from the middle, but in the end he fired his shot over the crossbar. However, it was the Ethiopians who settled into the match first and came agonisingly close to opening the scoring in the 17th minute when Hichani Himonde and Sunzu failed to clear a pass from Adane Girma. This allowed Saladin Said to lob the ball over Kennedy Mweene and towards the empty net but somehow it bounced on the hard turf and went over the crossbar. Chipolopolo captain Christopher Katongo should have done better in the 21st minute when he was left unmarked to connect with a pinpoint cross from Rainford Kalaba, but he rushed his header wide of the post. Then three minutes later the Walya Antelopes were awarded a penalty when Said was brought down by a late tackle from Chisamba Lungu inside the box. He then stepped up to take the spotkick, but Mweene pulled off a good save as he dived to his left to parry the ball to safety. Katongo came close to finding the opener at the other end a minute later when he drilled a low shot from outside the penalty area, but Jemal Tassew was able to turn the ball around the post. Then in the 31st minute Lungu ran onto a through-pass and managed to lob the ball over the advancing Tassew, only for his effort to go wide of the target. However, the Zambian was caught late by the Ethiopian goalkeeper, who was then given a straight red card for his dangerous lunge, leaving his side to play most of the match with one man less. Herve Renard’s side eventually found the back of the net on the stroke of halftime as Mbesuma collected a flick from Isaac Chansa on the edge of the area before firing past the exposed goalkeeper. Despite their numerical advantage, Ethiopia continued to play positively and in the 50th minute Getaneh Kebede tried his luck with a long distance shot which flew wide of the top left corner. Seven minutes later Mbesuma tried to grab his second goal of the match when he collected a loose ball outside the box but he failed to hit the target as his shot went wide of the post. Ethiopia then levelled matters in style in the 65th minute when Said found Girma on the right, who then beat Mweene with a powerful shot which brushed the inside of the near post. Four minutes later Mbesuma thought he deserved a penalty when he went down inside the box under a challenge from Aynalem Hailu, but the referee booked the forward for simulation instead. Zambia then threw men forward as they looked to regain their lead, but substitute Jacob Mulenga sent his header over the crossbar in the 74th minute, before Mbesuma saw his low effort pushed wide by the goalkeeper. Said had half a chance to steal maximum points for his side in the second minute of added time when he was picked out by Girma on the edge of the area, but his volleyed attempt was blocked by Sunzu.